YouTube is the most popular video sharing website visited by millions of people daily. If you want to find recently watched videos then YouTube watch history can of great help to you. 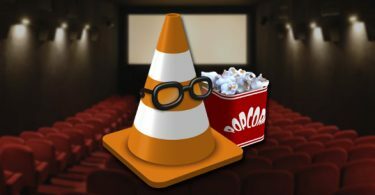 It will also aid you in improving video recommendations and pausing or deleting your history. There will also be an option of deleting entire history at once. The YouTube history can be easily cleared on almost any device. The first and foremost step is to open the YouTube app. The next step is to touch the guide icon that is available adjacent to the red YouTube “play” icon. On touching it, the list of menu items will open. You may need to choose the “Settings” icon in some versions of the YouTube app as guide icon is not accessible in every YouTube app. Now you need to select history option from this list. If you want to open more options then you can click on “Menu”. 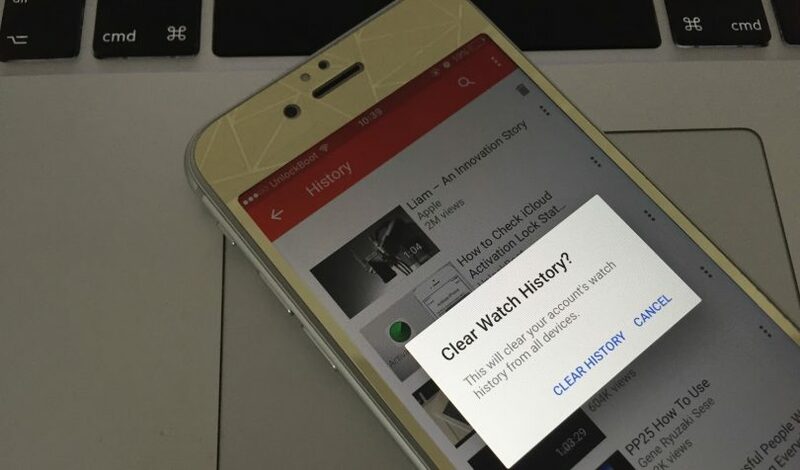 The “Clear History” will delete all the watch history at once while “Remove from Watch History” will allow you to clear your desired video only. 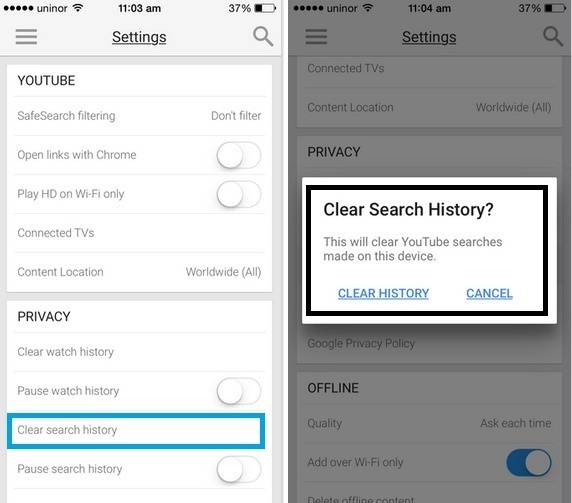 Come back to main screen of the YouTube app for clearing your search history by selecting Menu → Settings → Search → Clear search history. If you will choose “Never remember history” then your searches will not be stored in your history. The very first step is to sign in your account and select History option. After this, you need to click on “Search history”. Now choose “Remove from Search history” option from the menu. Go to Account > History > Search history and click on Clear all for clearing search history from your account. The process begins with opening the YouTube app on your iOs device. Now you need to touch the guide icon that appears like three horizontal grey bars to open up a list containing menu items. Tap the “History” button for observing the list of videos that you have watched recently. Press the trash icon for deleting all the watch history. Sign out from your account for clearing your search history. If you are unable to sign out then tap the Home button two times. In this way, the YouTube app will be closed. Sign in your account, click on history option and then tap Search history. Go to the menu and select Remove from “Search history”. The YouTube search history can be cleared from your account at once by going to Account > History > Search history and then tapping Clear all. You need to follow the instructions given below for achieving this target. Open the guide on your TV, gaming console or any other media streaming box. You can have access to guide option by any of the ways given below. The word”Guide” may be displayed on the screen of YouTube. It will look like an icon having three horizontal grey bars. You will also find the red YouTube icon next to it. Now choose settings option to see a list of all watched YouTube videos. After this, click on “Clear watch history” for removing all videos that you have watched from the list. If it does not work then you have to sign in to the same YouTube account by utilizing PC for deleting videos. You can also delete the search history by clicking on the search icon and choosing “Clear search history”. 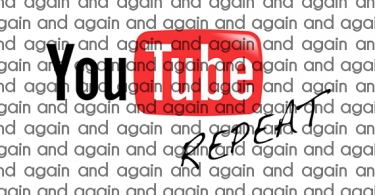 The very first thing that you have to do is log in to your YouTube account. After this, click on guide icon, available next to the YouTube logo for opening list of links. Select “history” present on the left side near the top of your list. 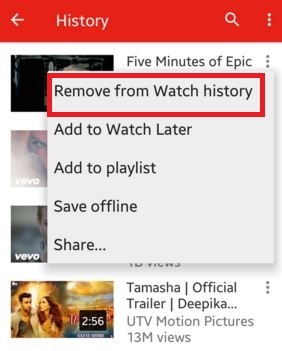 You can also delete the all watched YouTube videos in one click by tapping “Clear all watch history” button. If you want to clear watch history one by one then move the mouse pointer to the right side of the screen and look for three gray dots. If you do not find these dots then you can try the latest version of Mozilla Firefox. On finding dots, click it and choose “Remove from Watch History”. The future videos can also be prevented from being stored by clicking “Pause watch history”. You can also disable this feature by selecting “Resume watch history” in the same location. If you want to remove entire search history then find the “Search history” link and then click on “Clear all search history” button. The single item can be removed by clicking on three grey dots. You can also choose “Pause search history” for stopping storage of your searches in the future. You can even delete browser history by navigating to “History” –> “Show All History” and removing each YouTube video from it.